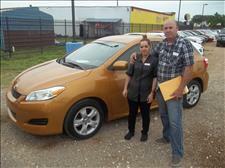 IGNACIO BOUGHT THE 2013 TOYOTA YARIS FOR HIS DAUGHTER. 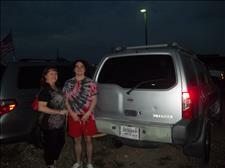 ALICIA AND HER SON PICKED UP THE NISSAN XTERRA FOR TRANSPORTATION. 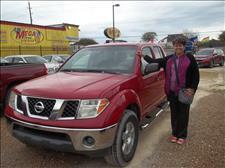 GRACIELA CAME OVER FROM BROWNSVILLE TEXAS TO BUY THE NISSAN FRONTIER 4 WHEEL DRIVE. 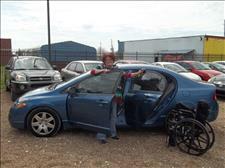 CHRISTINA CAME TO BUY A RELIABLE FUEL EFFICIENT CAR AND TOOK THE 2009 HONDA CIVIC. 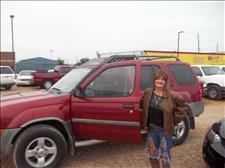 LINDA WAS LOOKING FOR A SUV AND FOUND THE NISSAN XTERRA. 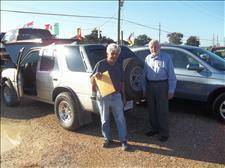 ROBERT WAS LOOKING FOR A 4 WHEEL DRIVE VEHICLE TO TAKE TO BELIZE CENTRAL AMERICA. HE DECIDED ON THE ISUZU RODEO. 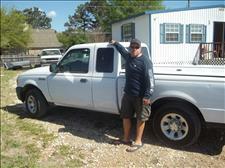 ANDREW NEEDED A SMALL TRUCK FOR HIS POOL CLEANING COMPANY AND HE CHOSE THE RANGER. 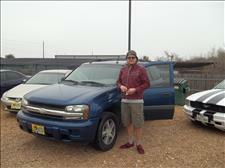 CHRISTOPHER WAS LOOKING FOR A GOOD CASH VEHICLE. HE LOVED THE CAMRY. GARY WAS LOOKING FOR A SUV FOR HIS DAUGHTER. HE CHOSE THE JEEP . 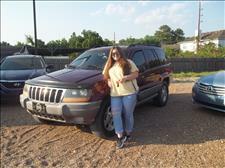 STEPHEN BOUGHT A JEEP GRAND CHEROKEE FOR HIS DAUGHTER A GOOD SUV FOR TRANSPORTATION. 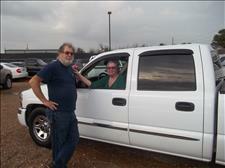 LAURA CAME TO US FROM TOMBALL TX TO FIND A STRONG TRUCK TO HAUL HER HORSE TRAILER. 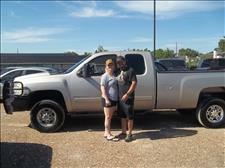 SHE PICKED OUT THE CHEVY SILVERADO 2500 DURAMAX DIESEL. 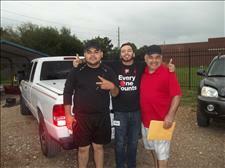 JAIRO NEEDED A TRUCK TO WORK AND PLAY. 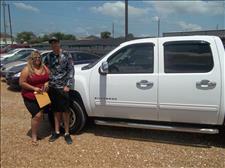 HE CHOSE THE GMC SIEERA. TRACEY WAS OPENING A BUSINESS AND NEEDED A SMALL TRUCK TO DELIVER APPLIANCES. HE CHOSE THE NISSAN FRONTIER. 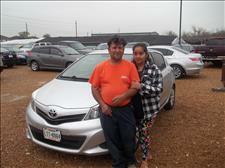 TANVIR JUST MOVED TO HOUSTON FROM INDIA AND NEEDED A GOOD RELIABLE CAR. 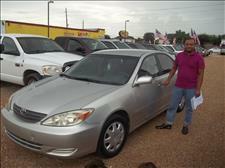 HE BOUGHT THE TOYOTA CAMRY. JEMA NEEDED A SPACIOUS SUV. 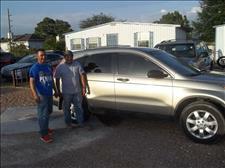 THEY DECIDED ON A HONDA PILOT. 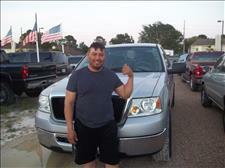 ARMANDO CAME FROM LAKE JACKSON TO BUY A SMALL SUV. HE PICKED THE HONDA CRV. 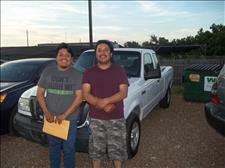 IGNACIO WANTED A STRONG SMALL TRUCK AND DECIDED ON THE NISSAN FRONTIER. 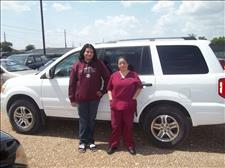 CHRISTEN CAME FROM NACOGDOCHES AND WAS LOOKING FOR A SMALL SUV. 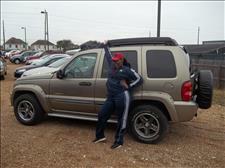 SHE FOUND THE JEEP LIBERTY. 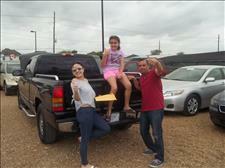 JACINTO AND WIFE CAME TO BUY A TRUCK FOR THE FAMILY AND DECIDED IN A 2011 CHEVY SILVERADO CREW CAB. 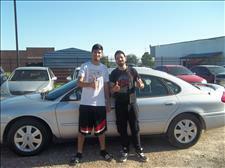 JOSE CAME FROM WILLIS TEXAS TO BUY A FUEL EFFICIENT CAR. 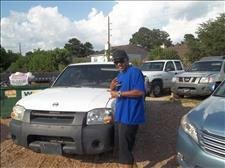 HE ENDED UP WITH THE HONDA ACCORD. MARIO AND DAD CAME OVER TO FIND A GOOD SMALL TRUCK FOR WORK. THEY FOUND THE FORD RANGER TO WORK WITH. 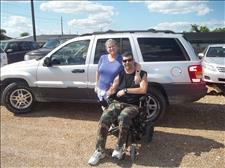 MICHELLE AND HUSBAND CAME FROM BAYTOWN TO BUY A JEEP GRAND CHEROKEE 4 WHEEL DRIVE. 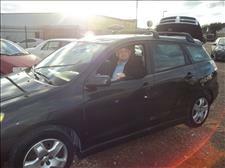 JORGE NEEDED A VEHICLE FOR HIS WIFE AND BOUGHT THE 2010 TOYOTA MATRIX. 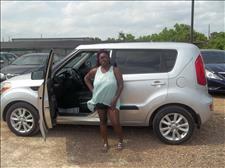 NAQUISHA WANTED THE KIA SOUL WHEN SHE SAW IT. A GOOD FUEL EFFICIENT SUV. 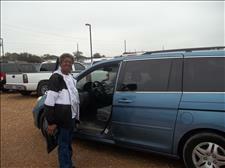 JEMA WANTED TO GET AN SUV AND LOVED THE HYUNDAI SANTA FE. 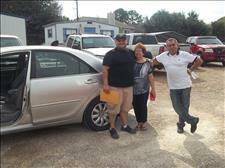 ROGELIO AND WIFE CAME TO BUY A FUEL EFFICIENT VEHICLE. 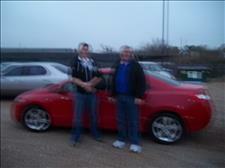 HE CHOSE THE HONDA CIVIC COUPE. 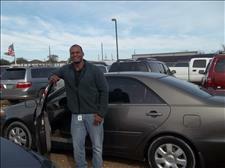 BALIHAR CAME FROM BELLVILLE TO BUY A GOOD RELIABLE CAR WITH LOW MILES. 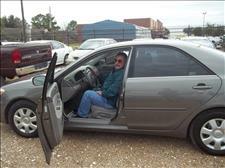 HE PICKED THE 2007 FORD TAURUS.  THONG IS AN ELECTRICAL ENGINEER AND WAS LOOKING FOR A VEHICLE TO WORK IN WITH. 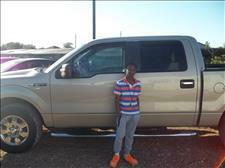 HE PICKED THE 2010 FORD F-150. 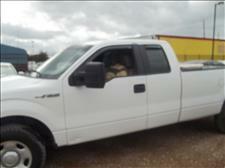 JUSTIN CAME TO US AND WAS LOOKING FOR A SMALL TRUCK FOR HIS JOB. 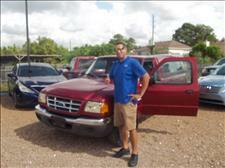 HE PICKED THE 2007 NISSAN FRONTIER 4 WHEEL DR.
ENRIQUE STARTED WORKING FOR COMCAST AND NEEDED A RELIABLE STRONG TRUCK FOR THE JOB. 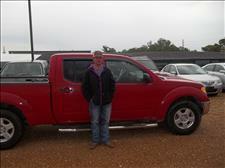 HE CHOSE THE 2010 FORD RANGER EXT. CAB. 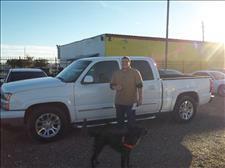 NESTOR NEEDED A GOOD TRUCK TO WORK AND TRAVEL WITH FAMILY AND PICKED THE CHEVY SILVERADO. 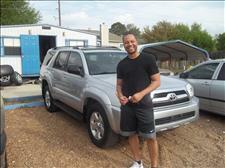 DEMARCUS CAME WITH THE FAMILY AND DECIDED ON THE 2007 4RUNNER. 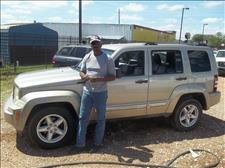 GERALD NEEDED A NICE SUV TO RIDE IN AND PICKED OUT THE 2011 JEEP LIBERTY. 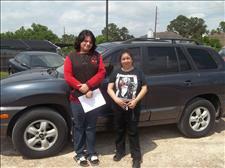 MARIA GARCIA CAME FROM ANGLETON TEXAS AND WANTED TO BUY THE CHEVY TAHOE Z71. 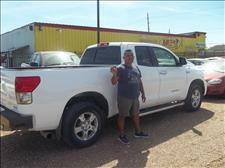 PEDRO NEEDED A STRONG TRUCK FOR HIS TILE BUSINESS AND HE PICKED A STRONG TOYOTA TUNDRA LIMITED 4WD. 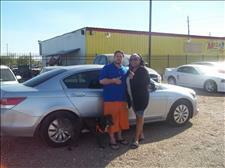 SHANE WALSH AND WIFE DECIDED TO BUY THE HONDA ACCORD FOR ITS RELIABILITY. KURT HAS A POOL CLEANING COMPANY AND NEEDED A GOOD RELIABLE TRUCK TO DO THE JOB. 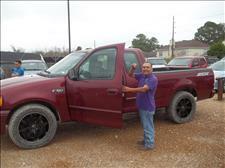 HE DECIDED ON A FORD RANGER. 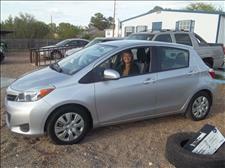 LUCIA WANTED TO BUY A CAR FOR HER DAUGHTER AND SHE PICKED A CUTE TOYOTA YARIS. BETTY NEEDED A RELIABLE CAR TO GET AROUND IN. SHE DECIDED TO BUY THE HONDA CIVIC. 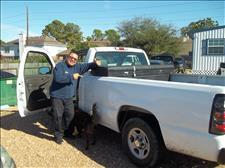 ERIC CAME FROM ROSENBERG AND NEEDED A STRONG TRUCK FOR HIS COMPANY. 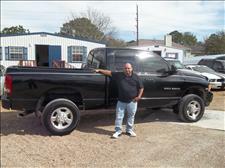 HE DECIDED ON THE DODGE RAM 2500 4 WHEEL DRIVE. 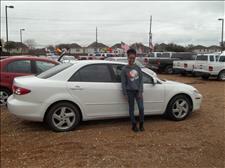 KARRA CHILDS IS GOING TO SCHOOL AT SAM HOUSTON STATE AND NEEDED A CASH CAR. SHE BOUGHT A MAZDA 6. 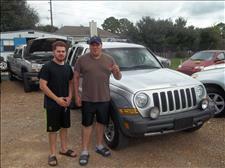 MICHAEL CAME TO US AND DECIDED TO BUY A CASH VEHICLE. 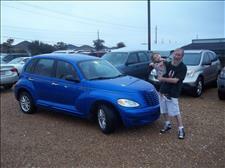 HE BOUGHT A CHRYSLER PT CRUISER. 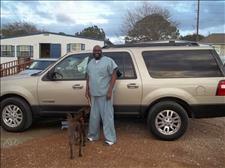 CHARLES JUST MOVED FROM PENSACOLA AND NEEDED A SUV VEHICLE. 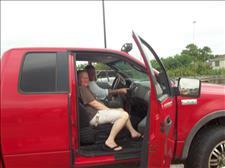 HE PICKED OUT A FORD EXPEDITION EL. 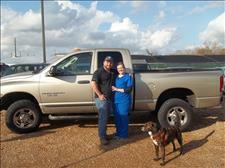 KEITH HUFFMAN AND WIFE CAME FROM BELLVILLE, TX AND DECIDED ON THE DODGE RAM 2500 4 WHEEL DRIVE. 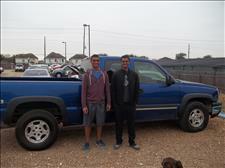 ROHAN AND HIS COUSIN CAME TO BUY A STRONG USED TRUCK WITH 4 WHEEL DRIVE TRANSMISSION BECAUSE HE WAS GOING TO START A NEW JOB IN WEST TEXAS; THEY DECIDED TO BUY THE Z71. 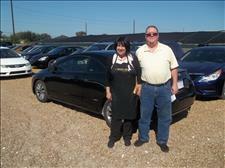 THOMAS CAME FROM HUMBLE AND WAS LOOKING FOR A HONDA CIVIC AND BOUGHT THE COUPE. 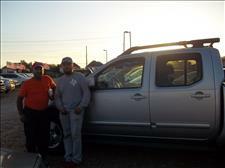 ANTONIO WANTED TO BUY AN SUV AND CHOSE THE TRAILBLAZER. TIA CAME AND BOUGHT HER FIRST VEHICLE. 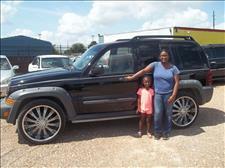 SHE PICKED THE JEEP LIBERTY RENEGADE. 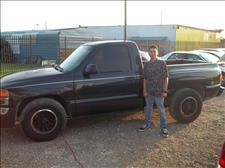 ROBERT HOFFMAN WAS LOOKING FOR A TRUCK AND FOUND OUT THAT OUR DEALERSHIP WAS THE EASIEST TO FINANCE. 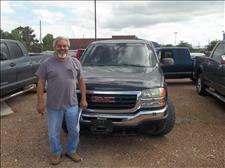 HE BOUGHT A GMC SIERRA. 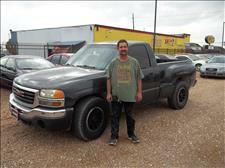 ROY WAS LOOKING FOR A GOOD WORK TRUCK AND CHOSE A CHEVY SILVERADO TO CONTINUE GROWING HIS COMPANY. 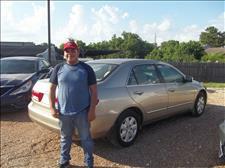 JOSE CAME TO US AND WAS LOOKING FOR A CASH CAR. 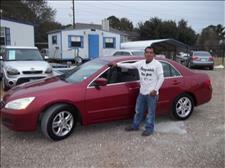 HE CHOSE THE HONDA ACCORD. 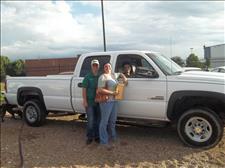 TIFFANY AND HER HUSBAND WANTED TO BUY A TRUCK AND THEY CHOSE A 2007 CHEVY SILVERADO. 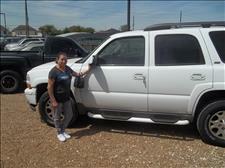 At Gil Auto Sales we are proud of the quality used cars we sell and our dedication to serve the needs of our customers. This is reflected in the amount of repeat business we receive. Whether this is your first purchase with us or one of many that you’ve had, you can count on our dedicated sales staff to make it the best buying experience possible.